EarthScope’s Transportable Array is now fully operational, providing a state-of-the-art science observatory spanning the entire state of Alaska and portions of Canada! The red symbols show the Transportable Array fully deployed across Alaska and northwestern Canada. Locations of newly deployed stations are shown by circles (~200), while contributing stations from existing collaborating networks are shown with squares and triangles (~80). The small black symbols are stations in the Alaska Earthquake Center network (circles) and the Yukon-Northwest Seismic Network (triangles). 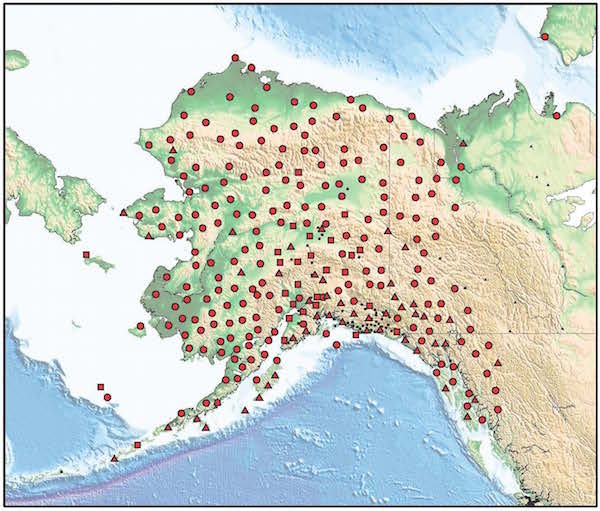 Nearly 280 geophysical stations have been deployed across Alaska and northwestern Canada in the last three years, supported by funding from the National Science Foundation and with the collaboration of many local, state, federal and native organizations. Transportable Array crews traveled by helicopter, boat and truck to install stations in some of the most remote locations on Earth! The stations are equipped with seismometers, weather sensors, infrasound, and other instruments, which record and transmit observations instantly and continuously, 24/7. The observations are freely available to anyone with internet access. present and future observing opportunities for this unprecedented new network of autonomous “micro-observatories”. We are particularly interested in exploring inter-agency / multi-agency interests and opportunities for how the Transportable Array observing capability can be used, particularly with respect to the compatibility of different observing interests. The National Science Foundation has committed only to a short duration deployment but is open to broadening the application to other science observations for longer durations, if the obligation to remove the stations is shared or undertaken by other stakeholders. Please join us for a half-day program (no cost) that will focus on the capabilities of this network and the impact it is having on scientific research and operational monitoring in areas as diverse as earthquakes, weather forecasting, volcanoes, tsunamis, and ecosystems. Remote attendees can sign on via GoToMeeting: https://global.gotomeeting.com/join/810978277. You can also dial in using your phone: +1 (571) 317-3122, Access Code 810-978-277. Please RSVP if you plan to call-in. For more information about the EarthScope Transportable Array in Alaska, visit our website. View the program and presentation slides from a similar meeting, "EarthScope Transportable Array Spans the Last Frontier", held in Anchorage in October 2017. Questions about the event? Contact Perle Dorr. Slides have been posted as .pdfs. Movies and editable slides in .pptx format can be requested.